If you like your dish without the “spice” omit the crushed red pepper. If you like your dish really spicy just add a little more! 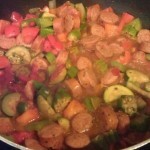 Place olive oil in large skillet, add sausage, bell peppers, zucchini, okra, onion, saute until vegetables are tender. Add in seasonings and tomatoes. Stir in balsamic and vegetable broth, cover and simmer on low 20 minutes. 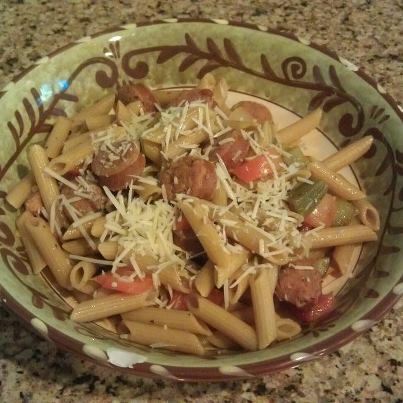 Toss with pasta and top with parmesan cheese.